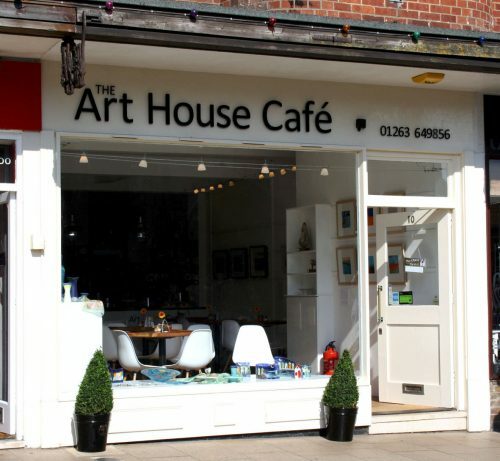 The Art House Café at 10 High Street, is directly opposite the church in the heart of Cromer. It’s in a great location in the centre of town with a lovely view of the church and people are finding the space a lovely calm and relaxing place to come and enjoy a delicious coffee and cake. The former ladies clothes shop has been transformed into a light and airy space in which to relax and savor delicious refreshments whilst enjoying the talents of contemporary East Anglian artists. 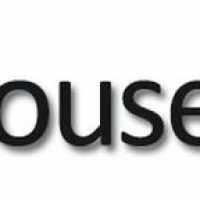 Showing a wide range of work from watercolour and oil paintings, ceramics, glass, driftwood art, jewellery, silk scarves and greetings cards so hopefully there is something for everyone to enjoy. The exhibitions change throughout the year and there will always be something interesting and thought provoking to see. 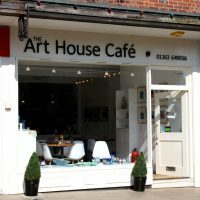 We look forward to welcoming you to the Art House Café.